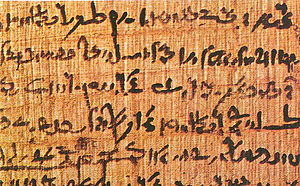 Papyrus is a kind of paper that was used in Ancient Egypt for writing. It was first made as far back as the 3rd millennium BC. It was made from a kind of reed called Cyperus papyrus. This plant was originally grown in marshy areas around the Nile river. The plant had a variety of uses. The Egyptians also used the papyrus plants to make boats, mattresses, mats, rope, sandals, and baskets. Specially cultivated papyrus, grown on plantations, was used to make the writing material. They were first used in Ancient Egypt, but they were later used throughout the Mediterranean region. This page was last changed on 11 November 2014, at 09:01.